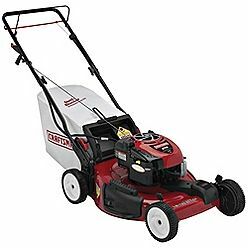 This Craftsman Front Wheel Drive 22″ Lawn Mower has a slightly higher torque than the the 37066, but all of the features are similar with the exception that it does not have an electric start. A nice lawn mower for suburban lawns. Other than that this lawn mower is 22 inches wide suitable for most urban lawns and still small enough to be easily stored when not in use. It also has 12 inch high rear wheels which makes it a bit easier to maneuver, especially when the rear grass catcher is full of grass. This particular lawn mower is available in all states with the exception of California. It does not meet California emission standards. There are mixed reviews of this lawn mower with some people really liking it, while others identified that the control bar was uncomfortable especially after an afternoons lawn mowing. This is probably not an issue for consumers with average size lawns. 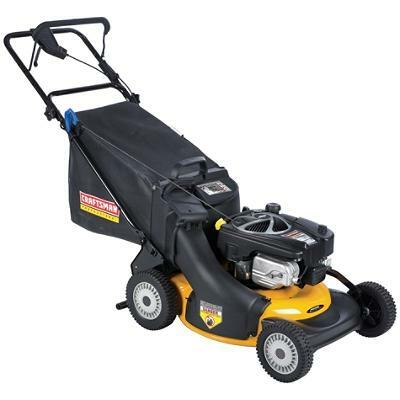 Engine: This Craftsman Front Wheel Drive 22″ Lawn Mower comes with a 700 series Briggs and Stratton engine delivering 7 foot pounds of torque. Propulsion: This Craftsman has a front wheel drive system. 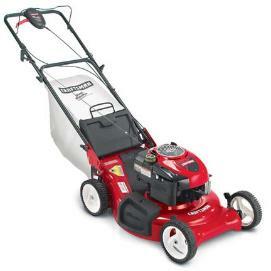 Warranty: This Craftsman Front Wheel Drive 22″ Lawn Mower comes with the standard Sears warranty. Operators of this lawn mower can also adjust the cutting height to several heights for optimum mulching or grass catching. It comes with the usual mulch, grass catcher and side discharge options and a variable speed system that allows you to set the speed to your walking style or to the thickness of the grass that you are cutting. Delivery: Most lawn mowers can be picked up in the store, however if you do not have the means to take it home yourself, delivery usually can be arranged for a delivery charge. You may want to consider borrowing a trailer or a van to bring home your lawn mower and avoid the delivery charge. Some vendors such as Home Depot, Lowes and others will rent a van to you by the hour to transport items purchased at their stores. The rates are quite reasonable. While cutting the lawn and using the side discharge, never allow anyone to stand beside the discharge or point the discharge at something that could be damaged by high-speed flying objects ejected from the lawn mower. This Craftsman Front Wheel Drive 22″ Lawn Mower is available in the United States in all states with the exception of California. It does not meet California emission requirements, which are among the most stringent in the world for pollution control. Reviews of this lawn mower are mixed with some owners very satisfied while others are unhappy about plastic parts that are wearing out prematurely. They compare to older machines that were much more sturdy. Other than that this is a full featured machine with an electric key start, front wheel drive machine with variable speed control to match your walking speed. It cuts a 22 inch wide swath which will make short work of most lawns without having the trouble of taking up a lot of space in your garage. It is 92 pounds in weight, so you may need a hand to remove it from your cars trunk or from the trailer depending on how you get it home. This craftsman lawn mower has a 3 way system – mulching, grass catching and side discharge to give you all of the options that you need when cutting your lawn. Many people are now into mulching, however when the grass gets too long, you can always switch to the grass catcher or side discharge. 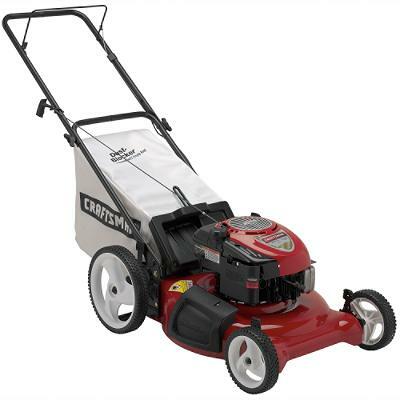 Craftsman Rear Wheel Drive 21″ Lawn Mower model 37109 comes with a 175 cc engine of the Briggs and Stratton variety. This is the work horse of the Craftsman series of lawn mowers for Sears and has been the engine of choice for many years. This rear wheel drive lawn mower has a 3 in one system for bagging your grass clippings, spreading them across your lawn or mulching the clippings to fertilize your lawn. The grass catcher is in the back providing more room to navigate around garden obstacles. The grass catcher bag is 2.5 bushels and comes with a dust blocker to protect you from blowing dust picked up by the lawn mower and blown into the bag. The wheels are ball bearing providing many years of service. This is a rear wheel drive lawn mower with a 21 inch wide cutting swath. See below for more features. Adjust the cutting height from a single position to one of six positions giving you the option to pick the optimum height for your lawn. This is a great little lawn mower for consumers with easy storage characteristics and lawn care capabilities. 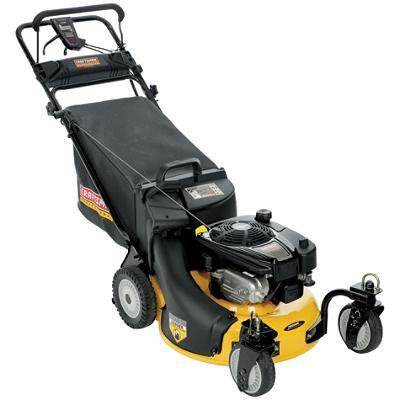 Based on 5 reviews that we found for the Craftsman Rear Wheel Drive 21″ Lawn Mower it is an excellent purchase. Consumers seemed to be really happy with their purchase and the performance of the lawn mower. What are your comments about this machine? For more posts about Craftsman lawn mowers, click here. The Craftsman Rear Wheel Drive 21″ Lawn Mower 37108 comes with a 175 cc Briggs and Stratton engine, the work horse of the Sears lawn mowers for many years. It is a 3 in 1 system allowing bagging, mulching and side discharge of the grass clippings giving you lots of options when cutting your grass. The grass catcher bag is 2.5 bushels in capacity and comes with a dust blocker to protect you from the dust that is sometimes picked up by the lawn mower in dry dusty conditions. This dust blocker will also stop small objects from penetrating through the bag as well. Propulsion is via the rear wheels which are 9 inch ball bearing wheels. With the grass catching bag on the bag, this provides an excellent counter balance to the weight of the lawn mower. Although only 21 inches wide, this lawn mower is fine for most consumers with an average sized lawn and it is also easy to store since it has a 21 inch wide foot print and the handles also fold for easy storage in compact spaces. Read below for more features. 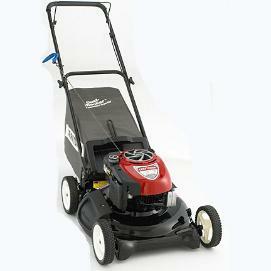 Engine: This Craftsman Rear Wheel Drive lawn mower comes with a Briggs & Stratton Platinum Series 175cc engine. This Craftsman lawn mower comes with a single point adjustment system to allow you to pick one of six positions for your grass cutting height. There is also a mulch plug as well if you do not want to capture the grass clippings or spread them on the lawn. This rear wheel drive lawn mower is an excellent choice for many consumers. The Craftsman Rear Wheel Drive 21″ Lawn Mower 88776 comes with pivot wheels on the front which makes it much easier to navigate around various obstacles in your lawn without having to stop or lift the mower to change direction. It is self propelled with a rear wheel drive and comes with a 190 cc engine. This is considered to be a really flexible machine to mow your lawn. This is a 3 in 1 cutting mower with mulching, side discharge and bagging capabilities. A nice feature is the electric start with a key, which makes it very easy for consumers to start their machine without having to be concerned about pulling the starter chord. The cutting height can be adjusted using one leaver across a range of one inch to 3 and one half inch height, which is pretty standard across the industry. 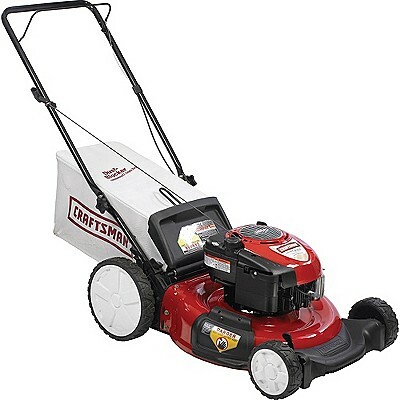 Another neat feature of this Craftsman Rear Wheel Drive 21″ lawn mower is that the handles fold down which makes it easier to store if you are tight for room in your garage or storage shed. There are also 6 forward speeds to allow you to pick the speed that is right for you. Read below for a full set of specifications and features. Item Weight (lbs. ): 105.0 lbs. Wheels & Tires:Front: 7 in. Rear: 9 in. Deck Cut Width: 21 in. Cutting Range: 1 to 3-1/2 in. This Craftsman 21 190cc Rear-Bag Push Lawn Mower comes with a 21″ wide cutting deck that is suitable for most suburban lawns, yet small enough to be easily stored in your garage or shed without taking up a lot of room. The engine is a Briggs and Stratton 190cc engine that is the work horse of all Craftsman lawn mowers. It also comes with a Rear-Bag grass catcher if you want to collect the clippings. It also can be used as a mulcher or just blow the clippings onto the lawn. This particular model is a push type lawn mower. Unfortunately this model is only available in Canada. It weighs 75 pounds and has large 11 inch tires on the rear to support the weight of the rear grass catcher bag. These large wheels make it easier to maneuver around corners and shrubs. The Craftsman 21 190cc Rear-Bag Push Lawn Mower comes with a 2 year warranty. You can also adjust it to one of six height positions and the rear bag comes with a dust blocker to protect you from dust and small objects when you are using the grass catcher. We noted that this particular lawn mower has 7 positive reviews at the time or writing with one negative review from someone who had trouble starting their lawn mower. This is another one of the Craftsman lawn mowers that comes with a lot of features and the famous Craftsman quality. 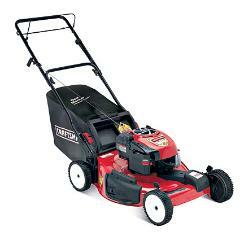 This Craftsman Professional 21″ 175cc Rear Wheel Drive Lawn Mower model number 38109 is a great machines suitable for most urban consumers. Small enough to store easily, large enough to make quick work of your lawn. Whether you want to bag the grass clippings, mulch the clippings or just spread them on the lawn, this lawn mower will do it all. The grass catcher comes with a 2.5 bushel rear bag and a dust blocker to protect you in dusty conditions. The wheels come with ball bearings ensuring a long lasting wheel set. This Craftsmen lawn mower is powered from the rear providing great flexibility to deal with just about any situation your lawn can throw at it. The specification and feature lists follow. The engine sports a ready start system, front deck handle and a mulch bag included. You can adjust the height of the lawn cutting from a single position to one of six positions. Delivery: Most lawn mowers can be picked up in the store, however if you do not have the means to take it home yourself, delivery usually can be arranged for a delivery charge. You may want to consider borrowing a trailer or a van to bring home your lawn mower and avoid the delivery charge. Some vendors such as Sears, Home Depot, Lowes and others will rent a van to you by the hour to transport items purchased at their stores. The rates are quite reasonable. 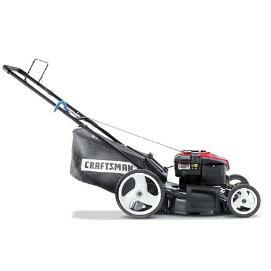 The Craftsman Professional 21 inch Rear Wheel Drive lawn mower is perfect for most consumers with medium size lawns. Storage is easier in smaller garages with the 21 inch deck, yet you can make quick work of your lawn without having the larger size lawn mowers. It comes with the standard well known Briggs and Stratton engine which goes for ever, provided you keep up with the regular maintenance. This lawn mower is self propelled from the rear wheels making it easy to manipulate around various landscaping in your yard. It is also a 3 in 1 machine, meaning that you can bag the grass clippings, mulch the grass clippings or just spread them on the lawn. This is a nice little machine for both consumers and professional lawn care companies alike. Adjust the height from one position to one of six height positions. This lawn mower comes with a 2.5 bushel grass catcher which also has a dust blocker. The dust blocker will be appreciated if you ever have to cut your lawn in dusty dry conditions, since it prevents the dust from exiting out the back of the grass catcher and hitting your legs. For more information about Craftsman lawn mowers, click here. The Craftsman Professional 33inch Rear Wheel Drive lawn mower may be larger than what many home owners require for their lawns, however if you have a large lawn to cut every week it will make short work of it with its 33 inch wide cutting width. Professional lawn care specialists will also appreciate its power, cutting width and maneuverability. There is a large 2 gallon gasoline tank to keep you going for extended periods and the 33 inch deck is actually a 3 in 1 deck. You can mulch, bag or spread the grass over the lawn as needed. It is also a rear wheel drive machine with flexible caster wheels on the front to make turning easier to cut around corners and landscaping around your lawn. This is a larger engine and therefore comes with key starting. No need to pull a chord and the manufacturer claims it is an easy start Ready Start, Smooth Start & MRS starting system. This is a craftsman lawn mower and will meet most if not all professional and non professional lawn care specialists needs. The lawn mower comes with a number of features that are listed above. Of particular interest is the deck wash cleaning system to make easy work of cleaning the grass of the underside of your lawn mower. Maintenance of the deck in this manner will ensure a long life machine that will meet your needs for many years. Delivery: Most lawn mowers can be picked up in the store, however if you do not have the means to take it home yourself, delivery usually can be arranged for a delivery charge. You may want to consider borrowing a trailer or a van to bring home your lawn mower and avoid the delivery charge. Some vendors such as Sears and others will rent a van to you by the hour to transport items purchased at their stores. The rates are quite reasonable. Always check the engine to make sure that there is sufficient oil in the engine before starting each day. Top up if necessary. Fill the fuel tank while the engine is cool. A good time to do this is before you start cutting the lawn. Fuel spills can sometimes cause fires. If you do spill any fuel, wait until it evaporates. Then try starting the engine to avoid any chance of fire. Always fill the fuel tank outdoors. 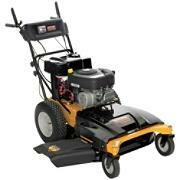 For more information about Craftsman lawnmowers, click here. 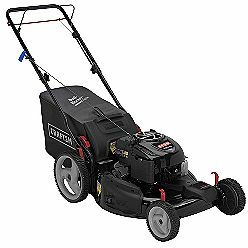 The CRAFTSMAN MD Self-propelled 3-in-1 Rear-wheel Drive Gas Lawn Mower is a perfect lawn mower for the suburban consumer with rear wheel drive that travels at a maximum speed of 3.3 miles per hour and a powerful 190cc Briggs and Stratton engine. The wide 22 inch deck will make short work of your lawn with options to bag your grass clippings, mulch them or discharge the clippings out the side. Note that there is a deflector that protects other people and objects near you from being hit by high speed projectiles when you are using the discharge option. The handle can be set to one of 3 positions for maximum comfort while mowing and the handle also folds down for easy storage in tight locations as well as transportation. There is a 2 year warranty on the this craftsman lawn mower for consumer applications. The cutting deck in addition to being 22 inches wide can also be adjusted to one of 5 cutting heights allowing you to achieve the desired height for your lawn. Cut it short for that manicured golf green look, or leave it long to protect the roots during those really hot summer days. It is your choice and easy to adjust. The mower speed can be adjusted up to a maximum of 3.3 miles per hour to match a comfortable walk behind speed. Consumers will like the idea of switching between the grass catcher attached at the rear of the lawn mower to a mulching deck to a side discharge. With choices like these you can maintain your lawn just the way you want to. This self propelled lawn mower also comes with one oil bottle. Check the engine before you start it and add the oil to the oil filler spout as directed in the manual. Always read the manual cover and follow the instructions as outlined to cover prior to starting the engine for the first time. All motorized equipment should be treated with respect and care. Start by reading all of the safety and operating guidelines outlined in the manual that comes with the CRAFTSMAN MD Self-propelled 3-in-1 Rear-wheel Drive Gas Lawn Mower. Follow these guidelines carefully and you should not have any problems with operating the lawn mower. Maintenance of the CRAFTSMAN MD Self-propelled 3-in-1 Rear-wheel Drive Gas Lawn Mower is pretty straight forward. Read the guidelines in the manual and follow them. Arrange to have your engine tuned up once a year and the oil changed at the same time. This applies to most consumer applications where you are cutting your lawn once a week. If you are using the lawn mower for commercial applications you may need to change the oil more often. Keep the housing free of debris to avoid the acid from the grass causing the housing to deteriorate. Also keep grass from building up around the muffler to avoid the possibility of fire. Check the spark plug. Make that it is not corroded and dirty. Replace if it is pitted. Always use clean fresh gasoline for your lawn mower. Following these tips and others in the manual will ensure that your lawn mower will last for many years. The CRAFTSMAN MD Three-in-one 22 Front wheel Drive Gas Mower comes with a powerful 190cc Briggs & Stratton engine delivering 6.5 foot / pounds of torque, powerful enough to drive the front wheel drive system at one of nine height positions. This lawn mower comes with a 3 in 1 deck system that mulches, bags your grass clippings or discharges the clippings onto the grass from the side discharge. Cut your grass to look like a golf course or leave it longer during the hot dry summer days. With 9 positions in height, you have a wide selection to set your lawn mower at just the right height. The mulch kit is included with this lawn mower as is the rear bag grass catcher. The handles also fold away to make storage and transportation easier. A bottle of oil is included which you will need to add before you start the engine for the first time. Follow the manufacturer’s directions for adding the correct amount of oil. Over filling with oil can damage your engine and also void the warranty. This lawn mower comes with a 2 year warranty for consumer applications. If you are using this lawn mower for commercial applications you should discuss the warranty with the dealer prior to purchase. Foldable handles also provide a great deal of flexibility as well as convenience for storage as well as transportation. If you have limited space in which to store the lawn mower during winter months, fold the handles down and put it in a corner of the garage or up on a large shelf. Also if you need to transport the lawn mower for repairs it is much easier to get it in the trunk of your car with the handles folded down. The installed mulch kit and grass bag are included with the CRAFTSMAN MD Three-in-one 22 Front wheel Drive Gas Mower, giving you the choice of mulching your grass, bagging it or just using the side discharge to leave the grass clippings on the lawn. With the dual drive control triggers this craftsman lawn mower is easy to drive and steer around shrubs and other landscaping that may be in your yard. All motorized equipment should be treated with respect and care. Start by reading all of the safety and operating guidelines outlined in the manual that comes with the CRAFTSMAN MD Three-in-one 22 Front wheel Drive Gas Mower. Follow these guidelines carefully and you should not have any problems with operating the lawn mower. Maintenance of the CRAFTSMAN MD Three-in-one 22 Front wheel Drive Gas Mower is pretty straight forward. Read the guidelines in the manual and follow them. Arrange to have your engine tuned up once a year and the oil changed at the same time. This applies to most consumer applications where you are cutting your lawn once a week. If you are using the lawn mower for commercial applications you may need to change the oil more often. For more Craftsman mower information, click here. We have had a craftsman lawn mower for over 30 years, in fact it is the same mower and if that is not a testimonial to a product I do not know what is. I have only had to change the spark plug twice, clean and maintain the carburetor twice and changed the oil every year. In fact it still does not burn oil but it is a bit black each year when I change it. We use the craftsman lawn mower every week from spring to fall. The craftsman lawn mower model that we have is a rear bagger with the large wheels at the back to support the heavier weight of a bag full of grass. I much prefer this type due the natural balance a full bag of grass on the back provides coupled with the larger wheels. These wheels are approximately 8 inch radius wheels. This type is a push mower with a 1.5 hp Briggs and Stratton engine. It is a two speed engine with a governor that increases the power as the load increases. We still have the original wheels and bearings, although one of the axles is about to fall off. The weld were it joins the frame is getting a bit week, so I expect it will need repair next year. Not a major thing when you consider the age of this lawn mower. I did have to replace push bar after it broke at it’s weakest point. An important point about repairs for a craftsman lawn mower is that most parts are easily obtained either new or from older machines. In my case I went to our local small engine mechanic and I was able to find a new handle of a newer machine that someone had not bothered to maintain. He charged me $10 for the part and it worked perfectly. Pretty good deal vs. buying a new lawn mower. Lawn mowers are pretty straight forward and craftsman lawn mowers are no different. If you are at all hand with tools , most consumers can do the repairs themselves as long as they follow a few simple guidelines. Whenever you fill the craftsman lawn mower with gas, turn it off first and be careful not to spill gasoline anywhere. If you do, wait till it evaporates before you start it again to avoid any possibility of fire. Changing the oil and sharpening the lawn mower blade require you to get underneath the lawn mower with your hands. Always disconnect the spark plug wire before doing any kind of work to avoid any serious accidents. If you follow these basic guidelines , most people will avoid any major accidents. The craftsman lawn mower brand is one of the best. Some people may feel they are a bit more expensive, however based on the length of time I have had mine, I would have to say the extra money is worth it. Of course the new machines come with more safety features and these are important and should not be altered. For example you must hold a dead man bar down to the push handle to keep the engine going. This is done for a reason and that is to avoid any possibility of someone sticking their hands in the wrong place while the engine is running. So how does one select one lawn mower over another? Of course you can compare all of the features and specifications. Horsepower, side or back discharge, mulching capability, height adjusters, grass catchers, folding handles, choke less engines etc etc. Craftsman lawn mowers have all of these features, so what do you look at when making a purchase of a lawn mower? Compare price, warranty, repair facilities and parts availability. Most of all compare reputation and feedback from friends and neighbors and articles and blogs such as this. You will get the best feedback from these people and help you avoid some of the less desired lawn mowers. Craftsman lawn mowers excel in all of these areas. Prices range from just over $100 to several hundred depending on power and features that you look for. A small lawn that you cut often does not need a large lawnmower. On the other hand a large lawn with several rolling grades may need a self propelled craftsman lawn mower with a mulching capability so you do not have to bag and dispose of lots of grass. Craftsman does have a large variety of lawn mowers to choose from, including push reel mowers without power, electric mowers, small gas mowers, mid range and larger machines that can run you as much as $1300 or more. Of course you can also purchase craftsman lawn mowers that are in the category of tractor mowers. Anyone with a large lawn of more than half an acre should consider one of these unless you are looking for lots of exercise, which is not a bad thing either. Don’t forget the storage requirements of these larger craftsman lawn mowers. You will need a large shed to protect your investment as well. Finally, change the oil every year, sharpen the lawn mower blade at the same time and keep up with all other maintenance requirements as they arise and you will have your craftsman lawn mower around for a long time. Feel free to post any blog comments on this article and let us know what you think of your craftsman lawn mower!